Adaptic, Vaseline Petroleum Gauze, Impregnated Gauze, Petrolatum Gauze, 8884413605, 8884414600, 8884415600, 8884416600, 8884417601. Vaseline Petrolatum Impregnated Gauze by Kendall is a non-adherent dressing used in wound care. It is a fine mesh and absorbent gauze that is impregnated with white petrolatum. 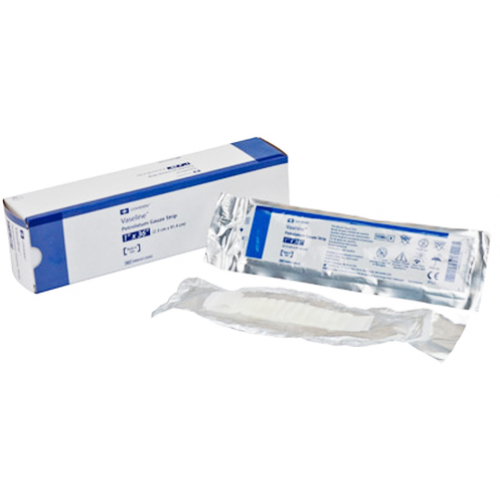 This gauze remains moist and is non-toxic, non-sensitizing, and non-irritating. This helps to minimize drying out and adherence. The petrolatum gauze is occlusive and clings and conforms to all body contours. It helps seal air leaks and unwanted fluid loss. Adaptic Vaseline Petrolatum Impregnated Gauze by Kendall is sterile. It comes in a variety of sizes. The gauze is packaged for convenience in either singles or boxes. This stuff is great! I seem to be allergic to mostly every other wound dressing as they cause ecxema but not this stuff. Because it is non-adhering there is no glue to irritate but it stays where you put it due to the vaseline it is impregnated with. I use it in conjunction with collagen particles for a vastly superior wound care environment. This is the only gauze dressing I would ever consider (better than J&J & Xeroform, hv tried both). Works as described, especially for bedsores. Highly recommended. Best find of the year!